Super easy, indulgent yet healthy Chocolate Peanut Butter Overnight Oats. These oats are super easy to make and store so you can enjoy them on a relaxing lazy weekend morning or grab and go when mornings are super busy! Happy Friday, friends! It’s a beautiful, not-too-hot August day here in Oklahoma (which is a miracle, y’all). We’re kicking off the weekend with happy vibes and this Chocolate Peanut Butter Overnight Oats recipe! Confession: I am SO ready for fall. Like….soooooo ready. Bring on ALL THE PUMPKIN things, warm spices, and delicious recipes (hello, Cinnamon Apple Pie Cookies). Yes please. I’m ready! Sadly, it won’t likely start cooling down in this part of the states until mid to late October. But to be honest, fall will most likely start for me exactly on September 1st, regardless of outside temps 😉 Because FALL! It needs to happen asap. Out of curiosity, what are your fave healthy fall meals/snacks/desserts? I want to hear all about it in the comments below! I’m so glad you asked. Overnight oats are made with rolled oats or old fashioned oats and either water or milk. I always opt for milk and usually go with almond milk but you can use any nut, dairy-free or dairy milk you like. Then you can flavor the oats with whatever you like for this recipe I choose chocolate and peanut butter and oh my gosh they are delicious! 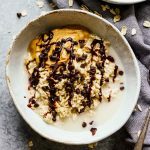 This Chocolate Peanut Butter Overnight Oats recipe is great for a healthy, quick, and easy breakfast! Make them in about 5 minutes, place them in the refrigerator, and eat them in the morning! It’s as simple as that. These overnight oats will last about 2 days in the refrigerator! Sometimes I make a big bowl of the recipe and scoop out a portion for breakfast in the morning, and then sometimes I make the recipe in mason jars to store them. They’re also great for taking with you to work or school! There’s nothing like a healthy, easy breakfast in a jar! Mix those ingredients into rolled oats and unsweetened almond milk, and that’s it! Creamy, sweet, chocolately, peanut buttery goodness in overnight oats form in 5 minutes. Mix the rolled oats and peanut butter together. Add in the almond milk and let sit in the refrigerator overnight. In the morning, top each serving with the chocolate syrup and mini chocolate chips. These look SO delicious you can’t go wrong with chocolate and peanut butter!